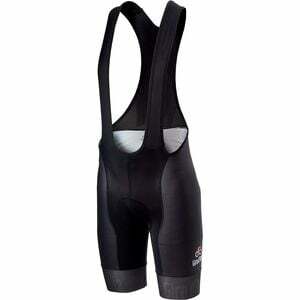 Product Condition: The Giro Volo Bib Short - Men's is in Excellent condition. These shorts were previously owned for three weeks. The following observations were made regarding these item. *They were tried on in indoors for an occasion. *There aren't any defects in them at all. *They got in chamois minor lint/dust, cleanable. *The original vendor tags are still attached. *All items sold as is, all warranties void. The 2018 Giro promises to be an exciting race and we'll be watching every stage from the edge of our seats. If your rides are starting to feel like youre always sitting on the edge of your saddle, we suggest looking at the Men's Giro Volo Bib Short where you can celebrate the Giro and add some much-needed new bibs to your wardrobe. Castelli adds some Giro livery to its Volo model bibs to have you looking great and more importantly, riding in comfort. Like the standard Volo, these bibs utilize the KISS Air chamois for long-ride comfort. Strategically placed Affinity fabrics offer excellent compression, breathability, and aerodynamics while the flat-lock stitching reduces irritation caused by friction. When things heat up, you'll be glad the straps and back are made of mesh and designed to keep you cool. Lastly, the GIRO Air mesh gripper leg bands keep the openings exactly where you put them and are available in the color Nero for an understated look or Rosa if you want to wear the Giro inspired bibs a little prouder.